Your team at Lone Tree Veterinary Medical Center wants to help you make the right choices when it comes to feeding your pet. We have waded through the vast amounts of information regarding pet food and have narrowed down a few important aspects of choosing a food that best meets your particular pet’s needs. The first thing most pet owners do when comparing different pet foods is to look at the ingredients list on the label. While the components of the food matter, it’s the food’s actual nutritional value that is most important to the health of your pet. The nutritional value of a food, however, can only be determined by testing the food clinically, in order to make sure that what the label claims is actually true. Unfortunately, many popular brands make claims on their labels that have never been tested or proven in a laboratory setting or a clinical study and, as a result, these claims may be misleading or, at worst, untrue. The Association of American Feed Control Officials (AAFCO) is a nonprofit organization that exists to help pet owners determine the actual nutritional value of a given pet food. While not a regulatory agency, the AAFCO has set standards for pet food ingredients that have become the foundation of many state laws and other regulations regarding pet food quality. These standards offer clarity for judging a pet food product by categorizing the food into distinct levels of quality and identifying the product’s level in a statement. AAFCO “Formulated” statement – Declares that the ingredients listed on the label meet minimum AAFCO nutrition requirements, but the food has not been clinically tested to make sure that the ingredients actually contain the nutritional value stated on the label. AAFCO “Feeding Trials” statement – Declares that the ingredients listed on the label meet AAFCO nutritional requirements and the food has been clinically tested and proven nutritionally effective, confirming that the label accurately represents both the ingredients and the nutritional value of the food. Formulated Foods – AAFCO approval of a formulated food means that the food’s label lists the recommended nutrients required to meet the minimum nutritional standards put in place by the AAFCO. However, these “label only” pet foods have undergone little to no real world testing. Consequently, it is not known if the ingredients listed on the label are actually in the food, in the described amounts, or will contribute to the health of the pet eating it. While the formulated statement is better than no statement, it still is not proof that the food actually provides the nutrition that your pet needs. This is why the “feeding trials” statement is most important. Feeding Trials Foods – AAFCO approval through feeding trial means that the nutrients claimed on a food’s label are actually in the food, and will be properly absorbed. A feeding trial involves feeding a particular food to live animals that have undergone extensive testing, including, analysis of blood levels and other diagnostic tests, as well as other forms of physical examination. The results verify that the nutrients and the amounts described on a label are actually in the food and will contribute to the health of the animal. Before you delve into the finer points of the ingredients listed on a bag of kibble, make sure it at least contains the AAFCO formulated food statement. Better yet, the feeding trials statement is the best way to be sure that the food you’re feeding your pet contains the nutritional value your pet needs, and in a form that can be absorbed and utilized as intended. A pet’s nutritional needs will change over the years, and it’s important to choose a pet food that provides the quality building blocks your pet needs for health and wellness. The AAFCO statements also address the life stage that the food is designed for, whether it be for a young, adult or senior pet. Not all veterinary “prescription” diets will have an AAFCO statement on the label, because they are formulated to treat a specific medical condition or disease. This requires that the nutrients be formulated and balanced to treat the medical condition, primarily, which may place the type and balance of nutrients outside of AAFCO nutritional requirements. Please note, however, that the ingredients and nutritional effectiveness of these diets are heavily researched, studied, and tested, and must meet AAFCO feeding trial standards in order to be a “prescribed” food. Further, because prescription diets are prescribed by your veterinarian as a form of medical treatment, they can only be sold by a licensed veterinarian. 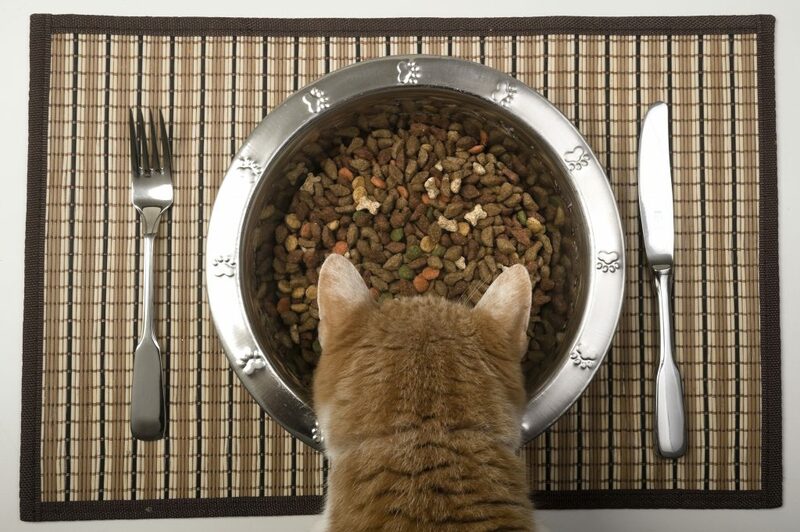 The three pet food product brands that offer prescription diets are Science Diet, Royal Canin, and Purina. So, if your veterinarian prescribes a prescription diet in any of these three product lines, you need not worry if an AAFCO statement is not present on the label. In summary, pet nutrition is a multi-faceted topic and there is a considerable amount of information available. The most effective thing you can do when selecting a pet food product is to educate yourself and ask questions. The staff at Lone Tree Veterinary Medical Center wants your pet to be as healthy and happy as possible, and we are always happy to discuss your pet’s nutrition with you!